CBD from Hemp Oil made for your vaporizer experience. We have hundreds of customers that buy from our store for various reasons. Health and Wellness... YES! these products are legal in all 50 states, because they are rich in CBD not THC. joined a Movement with a Pay Plan. Buy and sell HempVAP products. Our oil cartridges are fully compatible with the Brain Dart™ e-pen. We cannot guarantee their functionality with any other electronic vaporizer pen. 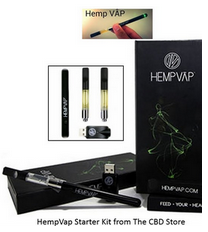 The HempVĀP™ Brain Dart™ e-pen is sleek, discreet, easy to use, and easy to refill. The Brain Dart™ is custom designed to work best with our HempVĀP™ oils. Comes with a handy USB charger that fits into any USB port for fast recharging of your Brain Dart™. WARNING: Using the HempVĀP™ Brain Dart™ will make you look like a futuristic space detective or something just as awesome. We’ll let you use your imagination on that one. Keep your Brain Dart™ fully loaded for less with HempVĀP™ Double Barrel™. Enjoy the cool vapor and clean mouth feel. Exhaled vapor is light and smells awesome. People are going to follow you around. The pied piper of HempVĀP™? That could be you. Double Barrel™ contains two oil cartridges of your choice: Strawberry, Honeydew, or Papaya. Each cartridge contains 1 gram of HempVap ^CBD hemp oil. It’s always good to have a One Shot™ handy. HempVap hemp-based high ^CBD concentrated oil comes in three tasty flavors. You’re gonna love the cool vapor and clean mouth feel. Exhaled vapor is light and smells awesome. You’ll be like a walking, vaping, ray of sunshine.